Luis Francisco Perez (born August 26, 1994) is an American football quarterback for the Birmingham Iron of the Alliance of American Football (AAF). He played college football at Texas A&M–Commerce from 2016–2017. Prior to that, he played junior college football at Southwestern College in Chula Vista, California. He was awarded the Harlon Hill Trophy in 2017 as the best football player in NCAA Division II and led the Lions to their second National Championship in football during the 2017 season, their first since 1972. Perez was born in San Diego, California to Juan and Carla Perez. His father was a professional soccer player in his native country of Mexico. Perez grew up in the Rancho Del Rey neighborhood of Chula Vista, California and started playing quarterback at a young age and for Junior High. When Perez was young, he went bowling with his family and eventually started to attend every Tuesday at age nine before entering a league before being entered into tournaments and soon becoming a top rated Amateur in California, rolling 12 perfect games with the plan to go to university on a bowling scholarship. He attended Otay Ranch High School. Perez played sub-varsity football his first two years in addition to basketball. He was moved to tight end to play in ORHS's Wing T offense, but stopped playing football due to frequently being moved positions, never playing varsity football at Otay Ranch High. He graduated from Otay Ranch in 2012. Perez walked on at Southwestern College in his hometown of Chula Vista with no high school film and no experience at high school level. He was recommended to switch positions but ignored it, instead opting to start as the 9th of 9 quarterbacks on the depth chart for the Jaguars, but eventually became the starter due to injuries and transfers of other players, earning the 2nd spot on the depth chart during the fall camp of 2013. At the third week of Southwestern's 2013 season, the starter was injured, leading to Perez's first debut for the team against Los Angeles Pierce College, throwing for 250 yards, two touchdown passes and one rushing touchdown, leading the team to a win. He played roughly half the season before injuring his leg. He started again the next season and led the Jaguars to a conference title and all conference honors throwing for 280 in 3 or more games and his best game of the season being against San Bernardino, throwing for 299 yards and 3 touchdowns on 31–44 attempts. After his 2014 season at Southwestern, Perez visited NCAA Division I school's in hope of a scholarship including UC Davis, Oklahoma State and several others because of what he described as "living on that Division I dream." Perez transferred to play for Texas A&M–Commerce, a Division II school in Northeast Texas. He redshirted his first year on campus during the 2015 season while the Lions won their second straight Lone Star Conference title with fellow Southern California native Harrison Stewart as the starting quarterback. The 2015 Lions qualified for the NCAA Division II playoffs for the first time since 1995. Perez nabbed the starting quarterback job over fellow redshirt transfer Gabriel Rodriguez in 2016. In doing so, he became the first player of Mexican-American or Hispanic descent to start at quarterback for the Lions. The Lions won 10 regular season games and repeated as Lone Star conference champions. The Lions defeated Colorado Mesa in the first round of the NCAA Division II playoffs, their first win in the Division II playoffs since 1991, before bowing out to the Grand Valley State Lakers in the second round. Perez was first team All-Conference, a Harlon Hill Award nominee, and Honorable Mention All-American. In 2017, Perez and the Lions went 10–1 in the regular season and finished second in the Lone Star Conference behind Midwestern State University and qualified for the NCAA Division II playoffs for the third straight year. The Lions defeated Winona State in the first round of the playoffs 20–7 and then knocked off the top ranked team in the region, the Central Washington Wildcats, in a double overtime thriller, 34–31. In the Super Region 4 final, the Lions defeated a heavily favored Minnesota State-Mankato team by a 31–21 score, setting them up to host the National semi-final against the Harding Bison at Memorial Stadium in Commerce. It was the first appearance in the semifinals since the 1980 season when the Lions advanced to the NAIA national semi-finals. The Lions downed the Bison's top ranked rushing attack 31–17 to advance to the National title game. Prior the national title game, Perez was awarded with the Harlon Hill Trophy, as the best football player in Division II. The Lions defeated the West Florida Argonauts in the national title game, giving A&M–Commerce their second national title in school history and their first since joining the NCAA in 1982. Perez once again was first team All-LSC in addition to being named National Offensive player of the year, Lone Star Conference Offensive Back of the Year, and First Team All-American. He participated in the NFLPA Collegiate Bowl at the Rose Bowl in Pasadena, California for his final college game. In his final season with the Lions, Perez passed for 298.3 yards per game ranking ninth throughout the entire NCAA, one of the only three players in all NCAA divisions with over 4,000 passing yards. Perez had completed 590-of-880 passes and had the Texas A&M-Commerce record of 22–3. Don Hansen Honorable Mention All-American (2016) Don Hansen's 2nd Team All-Super Region 4. Perez was not selected in the 2018 NFL Draft, however he was invited to attend rookie mini-camp for the Los Angeles Rams. He officially signed with the Los Angeles Rams as an undrafted free agent on May 14, 2018. Perez participated in Rams training camp and saw his first pro football action during the Rams' final preseason game on August 30, 2018 at New Orleans. Playing the entire second half, Perez completed 8-of-15 passes for 43 yards with an interception as the host Saints defeated the Rams 28–0. He was waived on September 1, 2018 and was signed to the practice squad the next day. He was released on September 18, 2018. After being waived by the Rams, Perez signed with the San Antonio Commanders of the new Alliance of American Football. On November 27, he was drafted in the first round, fifth overall by the Birmingham Iron in the AAF's quarterback draft. In his first game for the Iron on February 10, 2019 against the Memphis Express, Perez threw for 252 yards on 19 of 33 passing, leading the team to a shutout victory of 26–0. Perez has been married to his wife Brenda since 2015. He graduated from A&M-Commerce on December 14, 2017 along with his wife, the day before winning the National Title. 1 2 Maffei, John. "Perseverance paying off for former Southwestern QB". sandiegouniontribune.com. Retrieved February 17, 2017. ↑ "From the bowling alley and the baseball diamond, two Rams prospects have taken a long route to the NFL". Orange County Register. 2018-05-18. Retrieved 2019-02-12. 1 2 Edholm, Eric. "From bowling star to QB in five years, Luis Perez is the NFL draft's most unlikely prospect". www.profootballweekly.com. Retrieved 2019-02-12. ↑ Farmer, Sam. "Rams free agent quarterback Luis Perez has pro bowler skills". latimes.com. Retrieved 2019-02-12. ↑ "Ex-QB a national phenomenon". Retrieved 2019-02-12. ↑ "Luis Pérez le apunta a la NFL". Universo Deportivo (in Spanish). Retrieved February 19, 2017. ↑ "Pérez le apunta a la NFL". El Universal (in Spanish). Retrieved February 19, 2017. ↑ "Luis Perez – Football". Texas A&M University-Commerce Athletics. Retrieved 2019-02-12. ↑ Cooper, Clint (2017-11-28). "TAMUC – Sports". EastTexasRadio.com. Retrieved 2019-02-12. ↑ Davis, For CSGNetwork.Com, Computer Support Group – Dr. Gene. "Quarterback Passer Rating Calculator". www.csgnetwork.com. Retrieved February 19, 2017. ↑ "Former Southwestern QB Perez wins Harlon Hill Award as NCAA Div. II's top player for Texas A&M-Commerce – CCCAA". www.cccaasports.org. Retrieved December 30, 2017. ↑ "Luis Perez – 2016". Retrieved February 17, 2017. ↑ "FightingFalcons.com" (PDF). Fighting Falcons. ↑ "Six Lions named to Don Hansen All-Super Region Four Team". Texas A&M-Commerce. Retrieved February 18, 2017. ↑ Prosba, Zach. "2017 D2 Football Preseason All-America Team – HERO Sports". herosports.com. Retrieved August 20, 2017. ↑ "All-LSC Football Awards released". Lone Star Conference. Retrieved December 30, 2017. ↑ "Division II AP All-Americans: Texas A&M-Commerce quarterback Perez leads first team". NCAA.com. December 13, 2017. Retrieved December 30, 2017. ↑ "Perez & Machorro lead 29 honorees on All-Lone Star Conference Teams – Texas A&M-Commerce". Texas A&M-Commerce. Retrieved December 30, 2017. ↑ Prosba, Zach. 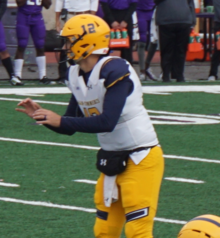 "VOTE: Best Returning Quarterback in D2 Football – HERO Sports". herosports.com. Retrieved August 20, 2017. ↑ Simmons, Myles (May 14, 2018). "Rams Sign Six College Free Agents, Waive Thompson". TheRams.com. Archived from the original on May 16, 2018. ↑ "Rams Make Final Round of Cuts". TheRams.com. September 1, 2018. ↑ "Rams Set Initial Practice Squad". TheRams.com. September 2, 2018. ↑ Simmons, Myles (September 18, 2018). "Rams Waive QB Brandon Allen, Cut Two from Practice Squad". TheRams.com. ↑ Wilson, Ryan (November 27, 2018). "Alliance of American Football QB Draft: Aaron Murray, Christian Hackenberg highlight QBs taken". CBSSports.com. Retrieved November 27, 2018. ↑ Inabinett, Mark (November 27, 2018). "Birmingham Iron picks Luis Perez, Blake Sims in AAF quarterback draft". The Birmingham News. Retrieved November 27, 2018. ↑ Talbot, Damond (2019-02-11). "AAF may have found their Tom Brady in Birmingham's Luis Perez". NFL Draft Diamonds. Retrieved 2019-02-11. ↑ "Luis Perez put on a show in AAF debut, had Twitter buzzing". Rams Wire. 2019-02-11. Retrieved 2019-02-11.